I had been working irregular hours over the last month as schools were on holiday and I had been working in the language center and with pretty earlier sunsets in Thailand I spent most of the day time I had left doing cloud drawings for the third exercise in this project. Finally I dropped on lucky with two days off which it turned out I needed for this exercise alone. The only suitable place for this exercise and probably most of the others in this module is a place called ‘Suan Rot Fai’ (Suan=Park, Rot Fai = Train) which is basically a large park on the outskirts of Bangkok with lots of trees, lakes, grass, sculptures and a rotting train. So I set out armed with my artists wrap, filled with different pencils and charcoal and my viewfinder that I made in the first part of this course to see what I could draw. After a long walk around the park getting familiar with the sites, sculptures, trees and other landmarks, I decided that it was more like Disneyland than a park with scaled down replicas of famous Thai landmarks and a kind of theme park with traffic lights and statues of strange looking Asian Cartoon figures. Being spoil- for-choice on what to draw I made the decision to get some sketches of more natural looking subjects. 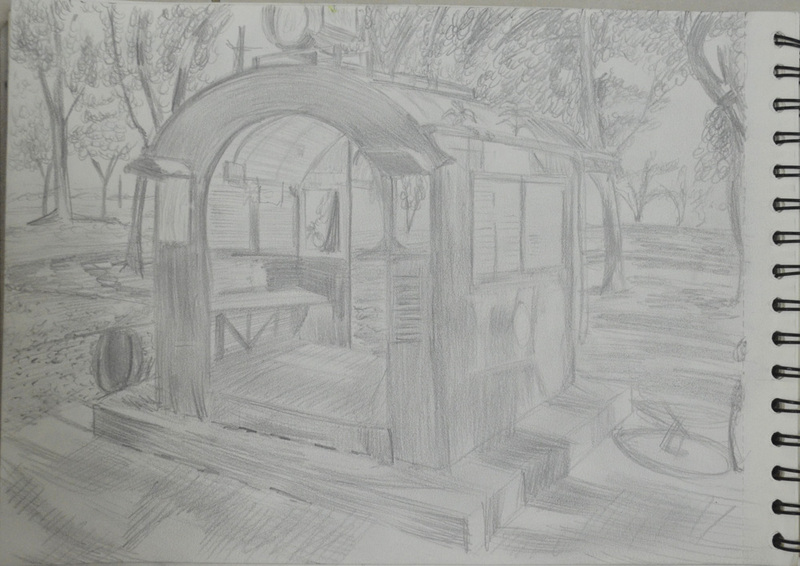 The first subject that caught my eye was some kind of park keepers shed, which was a bad choice for me really because when it comes to drawing any kind of structure like this I like the perspective to be perfect and although I followed the brief and didn’t erase any mistakes I might have made, I drew very slowly and the shed itself took me at least 30 minutes. It was in a great location and the trees above cast some lovely shadows which I think I did well to catch and I think I managed to do a great job depicting the light reflecting off the glass shutters at the side. When it came to drawing the trees I think I also did quite well but I could have chosen a better technique on drawing the leaves on the trees although the focal point of the picture, the shed, takes your mind off the rubbishy bits. Bangkok is very flat and the first time I rode around this park on a mountain bike this year I realised that this was probably the only place in Bangkok that had sloping paths so I took the opportunity to make the second sketch of a path swooping round a bend it was about 4:30 in the afternoon by now and in Thailand time that’s nearly twilight so I had to work a lot faster now and I realised that this was probably going to be my last sketch of the day, not just because I didn’t think I’d have enough time to do another before it got dark but also because the park was filling up with people jogging and on bikes as the Thais don’t like to get sun tans and so they come out as the sun is going down. 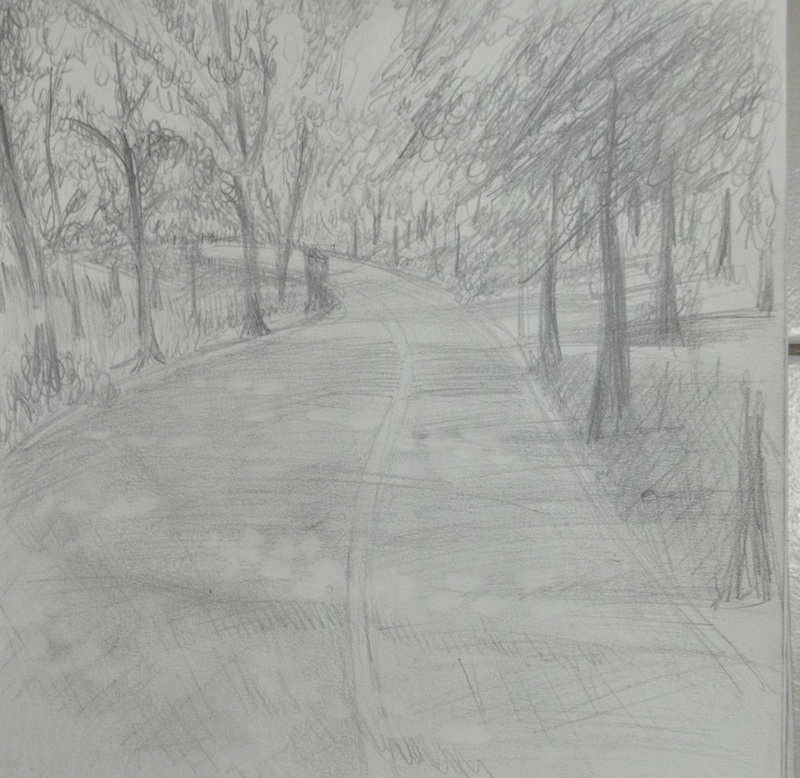 This time I started by drawing the snaking outline of the cycle path and the trees on the left hand side of the road. There was a hell of a lot of trees here for my liking and it was difficult to see where the trees in the background came up to behind the trees in front but to be honest I think I did quite well drawing them and the light that shone down the short grass behind them. I also think I did quite well drawing the trees at the back on the right hand side of the road but totally messed up drawing thee trees closest on the right. However like the first drawing with the road acting as the point of focus it kind of takes your mind off how badly drawn they are. The light shining on the road through the branches and leaves above was a challenge so I decided to go about this by hatching across the road to show the shadows coming off the trees, smudging the pencil lines with my finger and then erasing the areas of light with a putty rubber then where needed hatching again over the top for more shadow. To do the last two sketches I came out again the next day which was unfortunately a public holiday so I was limited for where I could sketch in peace as the park was full, so much for not wanting to get a sun tan. 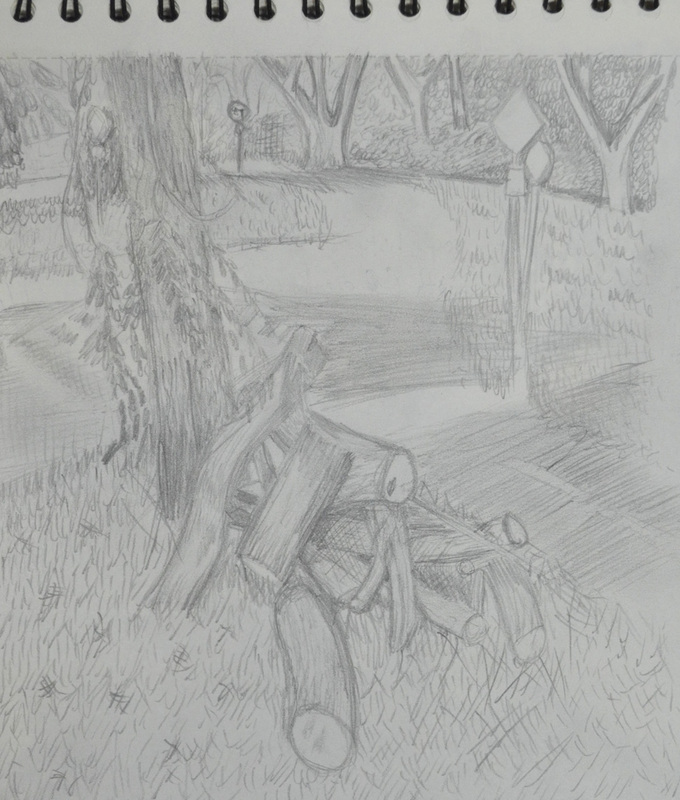 My third subject was something that I thought would be a lot easier to draw and found extremely difficult, logs against a tree. I sketched in the tree first to give myself a starting point with the logs and taking advantage of the negative space started work on the chopped down chunks of tree. However the hardest thing was making the logs look like logs as the texture was quite difficult to replicate in a quick sketch the tree behind however was a different kettle-of-fish I spent more time on that and I think I managed to pull off the texture quite well. Behind the tree was a miniature junction painted on the floor-fail! I did love drawing the shape of the big trees in the background though, I can’t wait to start drawing trees later on in this module, there are some great eucalyptus trees in the park. The grass was also a task as it was very patchy and the grass in Thailand is very different from the grass in the U.K., more like a weed than grass. Overall I am not very happy with this drawing but it was the quickest so far I just have to improve before I start drawing the 360 degree studies in 15 minutes per drawing! With the park being pretty full I found myself in places where the Thais wouldn’t go or at least wouldn’t be distracting me walking around in the background so I found myself looking at this clearing and with the sun beating down and everything in the foreground looking very dark it was the perfect opportunity to pull out my charcoal pencil. 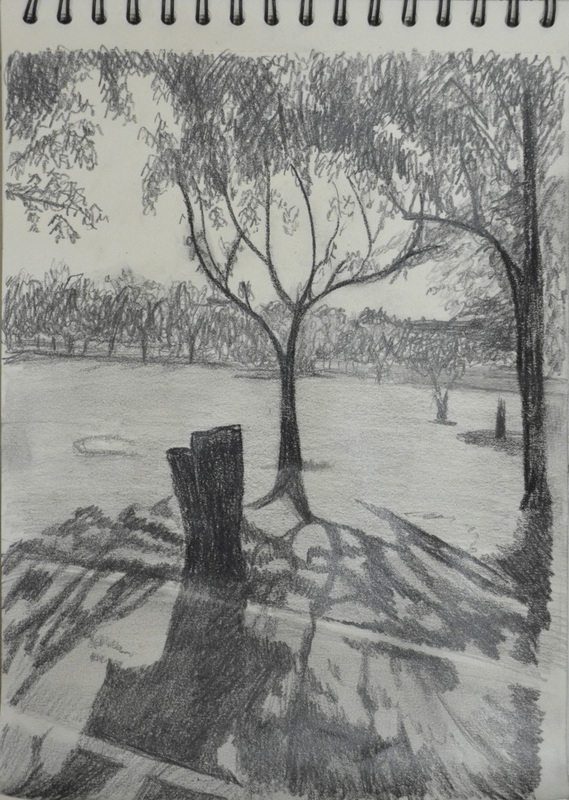 I had been using an HB pencil for the first three pencils and just wanted to use something different so I began with a charcoal pencil to draw in the tree, which when I finished reminded me of a Klimt painting for some reason then I drew in shadows with an EE, taking the shadows up to the road, drawing in the road with HB and then taking the shadows over the road. Unlike the previous picture the grass here was real grass and perfectly cut so instead of having to draw individual blades i simply shaded then smudged. This time for the branches of the tree itself I left the squiggles alone and used and drew the leaves with marks similar to those used by Albrecht Durer in my previous post Research Point: Different Artists’ Depictions of Landscapes and then resorted to the squiggles for the trees in the background to give the effect that they are in the distance. Their is a small like at the back on the left I found this quite difficult to draw you can tell there is something there but you can’t quite make out what it is.